Declan Kidney faces arguably the most intriguing team selection of his tenure in charge of Ireland as he prepares to pick his injury-hit side for Sunday's Six Nations clash against Scotland. 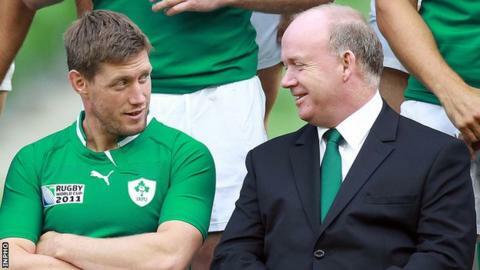 First up, the Ireland coach must decide whether to select an out-of-form Ronan O'Gara to replace injured Jonathan Sexton at fly-half. The other fly-half options are Paddy Jackson or Leinster's Ian Madigan. Madigan, usually a Leinster reserve, was added to the squad on Monday. With Keith Earls likely to be named at wing in place of injured Simon Zebo when the team is revealed on Wednesday, Kidney must also decide whether Luke Marshall or Fergus McFadden represent the better option to replace injured centre Gordon D'Arcy. Marshall took a full part in Ireland training on Tuesday after suffering bruising to both thighs in Ulster's win over Zebre on Friday. Brian O'Driscoll and Sean O'Brien were also fully involved in the session after being minor injury concerns but Donnacha Ryan's involvement was more limited as he recovers from a back spasm. "He (Ryan) took part in some of the session today and we're continuing to monitor his rehab," said Ireland team manager Mick Kearney. "Luke Marshall has recovered really well from his dead leg and trained fully this morning. There are no concerns about him." Kidney has made no secret of his high regard for Ulster youngster Marshall, 21, who started for the Irish in the non-cap win over Fiji in November. However, McFadden brings a versatility to the table with his ability to kick goals and experience of playing at fly-half possibly a factor given Ireland's current number 10 travails. The Leinster utility back may have to be content with a bench role with his fly-half versatility possibly seeing him edge out Luke Fitzgerald for a place in the match-day squad. While O'Gara's struggles in recent weeks has been the talk of Irish rugby, the likelihood is that Kidney will keep faith with the 35-year-old Munster man. However, O'Gara's poor showing for Munster against the Scarlets on Saturday night when he missed three out of five kicks at goal and also struggled in opening play, must have been a cause for concern for Kidney. That came after O'Gara's less than convincing outing as a replacement against England when his struggle to gain distance with his clearance kicks was a notable feature. But it will be a surprise if Kidney does not opt for the experienced O'Gara to start with the reserve fly-half role looking to be a tight call between youngster Jackson and Madigan. There are several other selection issues which are likely to occupy Kidney and his management team. With Mike McCarthy ruled out by injury, Donncha O'Callaghan looks likely to be drafted in at lock alongside Munster colleague Ryan with Ulster youngster Iain Henderson providing both second row and back row cover on the bench. Chris Henry's absence because of injury means that uncapped Munster duo James Coughlan and Tommy O'Donnell look to be vying for a bench spot with Peter O'Mahony and Sean O'Brien again occupying the flanker berths. The IRFU said on Tuesday that it had yet to decide whether to appeal against Healy's three-week suspension.